Concordo’s musicians have been serenading Southern Ontario event-goers for many years. 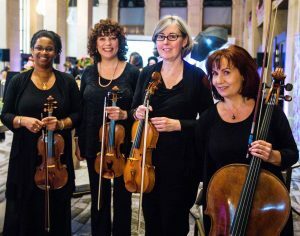 As a string quartet or trio, the musicians perform for weddings, receptions and other special events in all sorts of locations from casual backyard celebrations to the most elegant events. 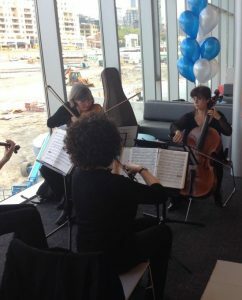 Members of Concordo have performed for a wide range of functions including receptions for the Toronto Film Festival and Gemini Awards, mayoral levies, political fundraisers and even on a construction site complete with hard-hats. Concordo performs a wide range of music to suit all tastes. “I have hired Concordo’s musicians for several functions and celebrations over the years and their music has added so much to these events. They are easy to work with and always professional.